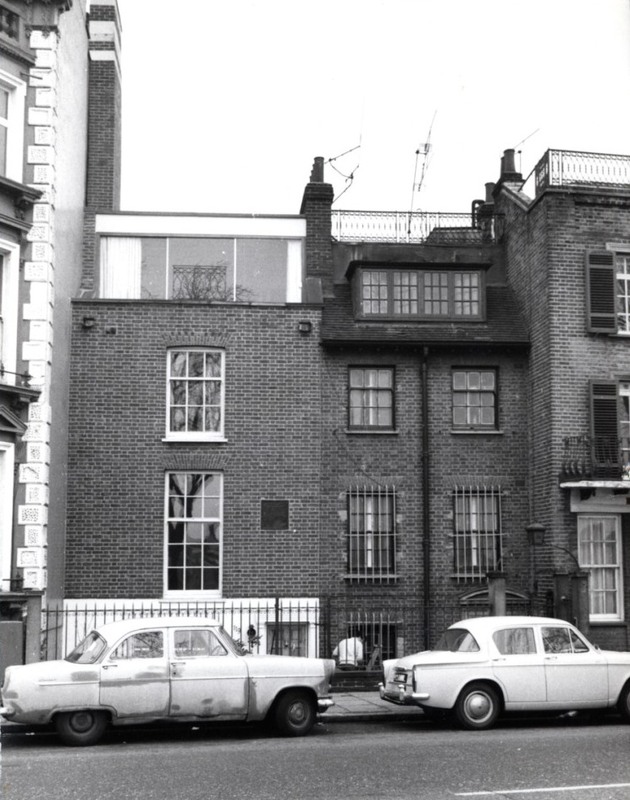 I was looking for a picture of 120 Cheyne Walk, where Arthur Ransome lived for a while in the period he describes in his book Bohemia in London. Number 120 is right on the edge of the World’s End Estate in a short terrace of 19th century houses between Blantyre Street and the smaller, older and more famous house next to it where JMW Turner had his last home. 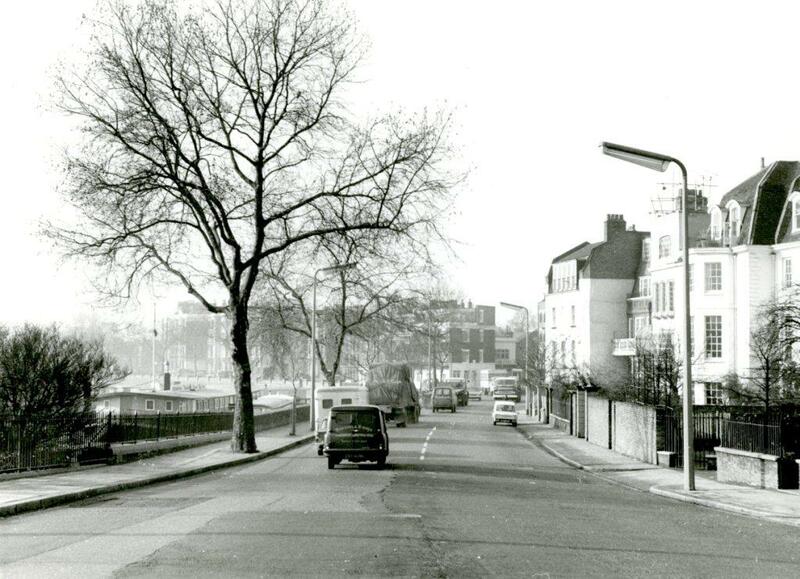 That section of Cheyne Walk, from the Old Church to Cremorne Road traditionally took you from the grandest and most affluent part of the street into a much lowlier part of Chelsea as you enter Lots Road. 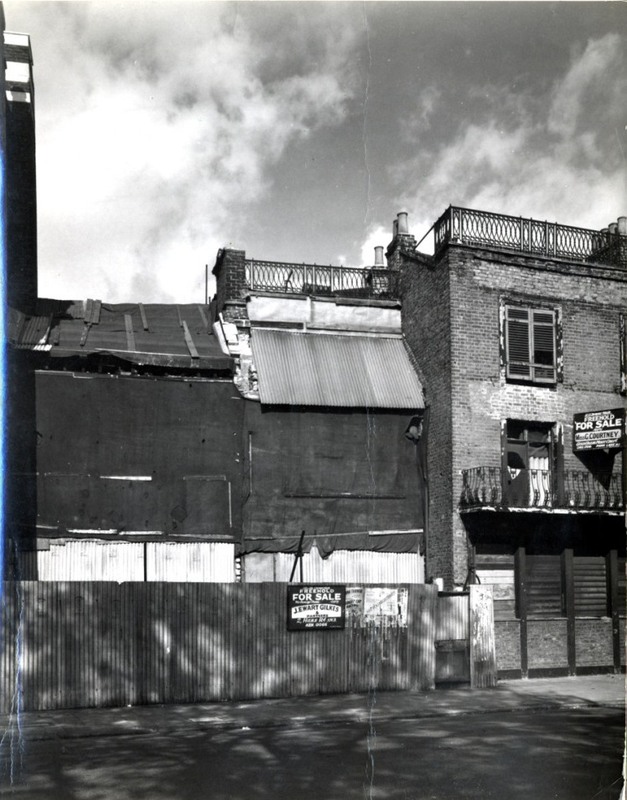 When I looked at John Rogers’s 1970 photographs I naturally thought here’s a blog post. So here you are. And there is the Old Church itself, reconstructed after the war, following severe damage during an air raid in 1941. 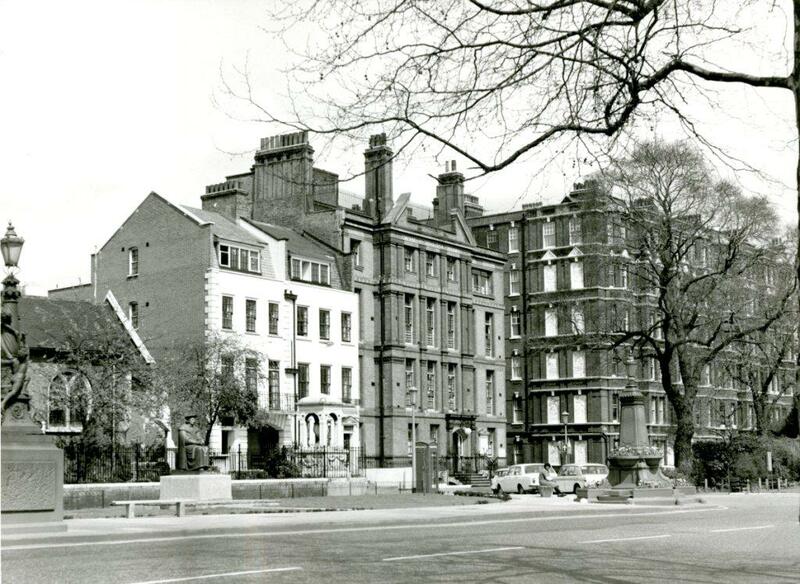 Next to it is Roper’s Garden, a sunken garden also built on the site of buildings destroyed in the air raid. I have sat in it many times. The small block of flats is called Roper’s Orchard. Margaret Roper was the married name of one of Thomas More’s daughters. The statue in the garden is called Awakening and is by Gilbert Ledward, who was born in Chelsea. The sheltered seats at the top of the stairs were a pleasant spot to shelter if the rain caught you on your way home from Battersea Park. 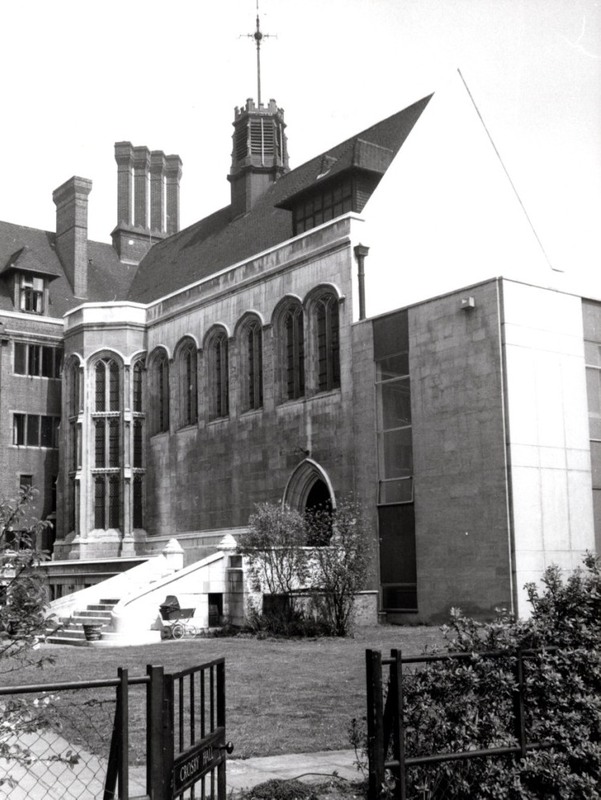 In the background you can see part of Crosby Hall, an ancient building which formerly stood in Bishopsgate in the City of London which was disassembled and reassembled in Chelsea in the 1910. 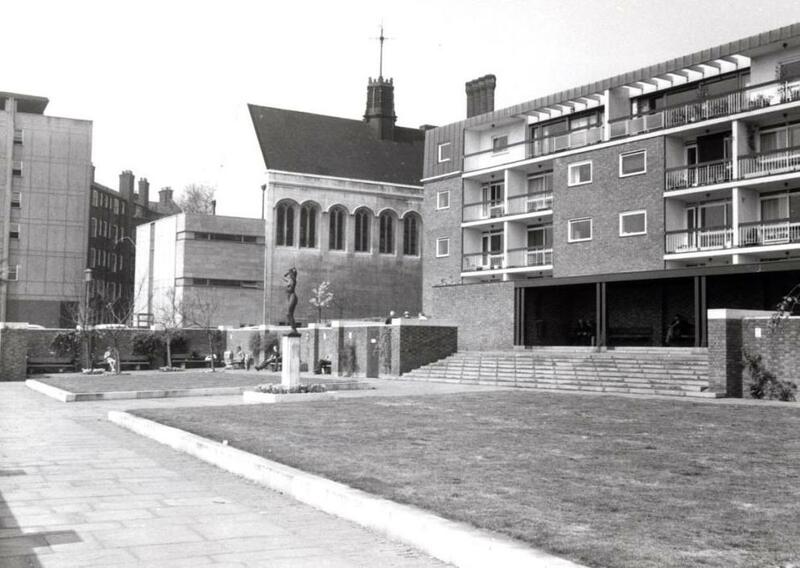 When I lived nearby Crosby Hall and its attendant buildings were used as a hall of residence. The hall was rented out for ceremonies and wedding receptions. 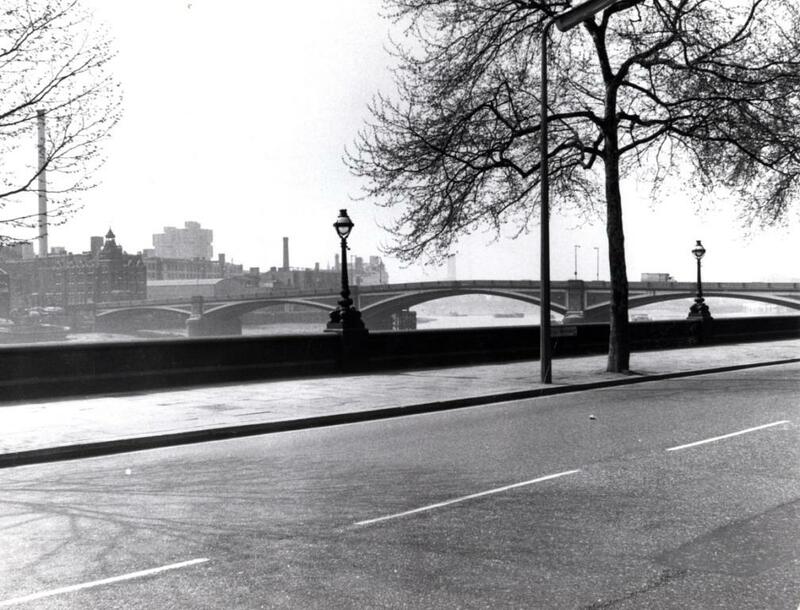 This pictures shows the open front onto Cheyne Walk. 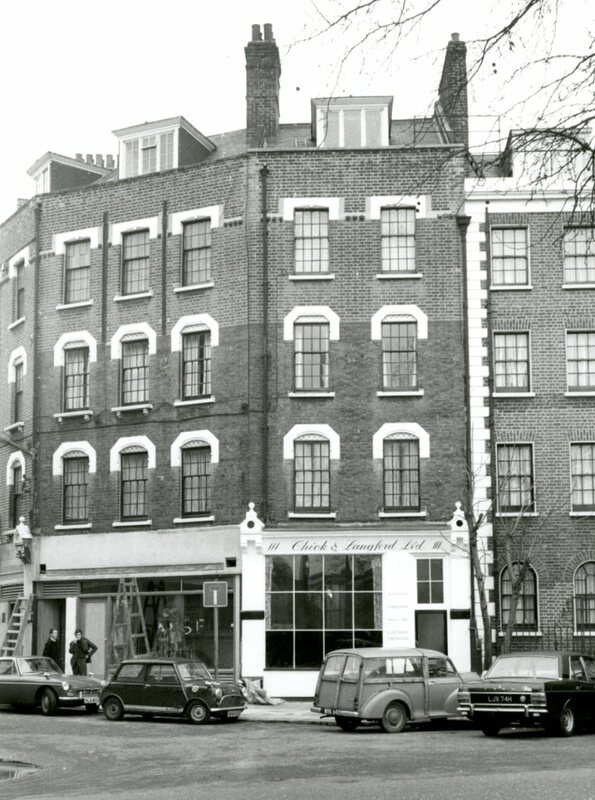 In 1989 the building was acquired as a private residence by Christopher Moran who built a pastiche of a Tudor palace around it so you can’t see this view any more. Across the river in Battersea there have been considerable changes as well. many of the buildings visible in the distance are no longer there. The photographer John Rogers has captured a pretty quiet moment on the road. This iron structure sits in the small green space where Battersea Bridge meets Cheyne Walk and Beaufort Street. 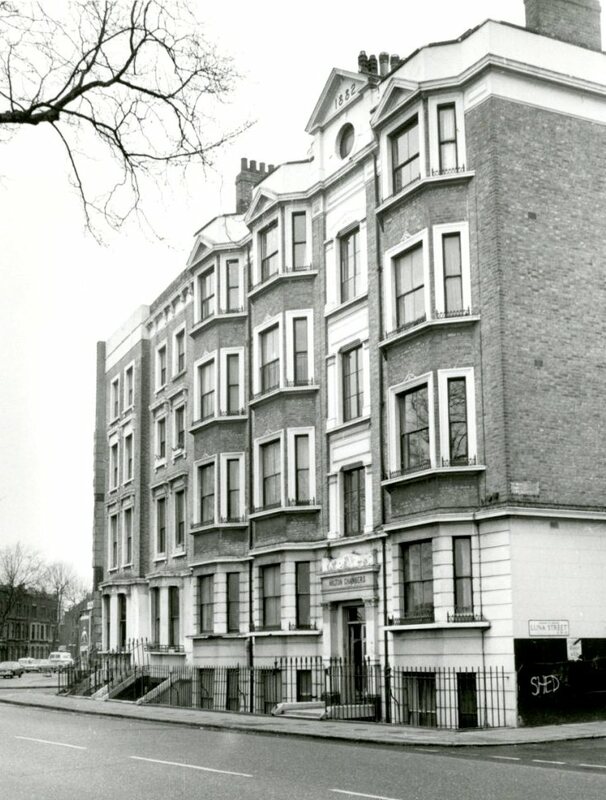 Belle Vue House, on the right is on the opposite corner. There is a well know Hedderly photograph showing the same corner more than a hundred years earlier. This is the view looking west, on a February morning in 1970, the same day as almost all the other pictures this week. You can just about make out this quizzical bird looking east. 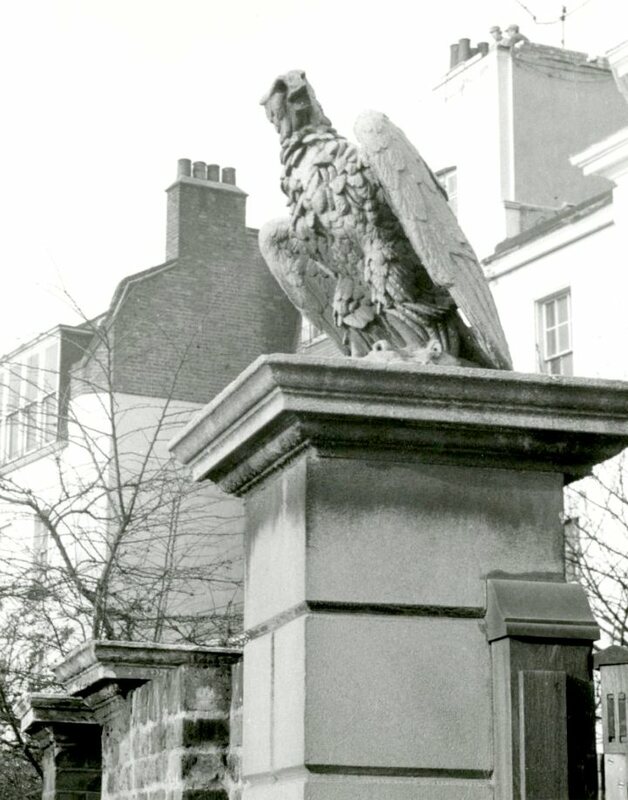 He sits on the gatepost of another ancient residence, Lindsey House. Lindsey House is another ancient house (built 1674), subdivided in the 18th century. The various parts of it have been home to the artists Whistler and John Martin and the engineers Marc and Isembard Kingdom Brunel. We’re going to move past the end of Milmans Street as I’ve covered it before. Moving west, this collection of houses curves away from the main road and leads north into Riley Street. Car spotters can start here although I’m sure no one will be able to identify the car under cover on the left. These should be pretty obvious though. This is the point where Munro Terrace curves away to become Riley Street. (once upon a time Davis Place became World’s End Passage) , with Apollo Place hiding behind the main road. 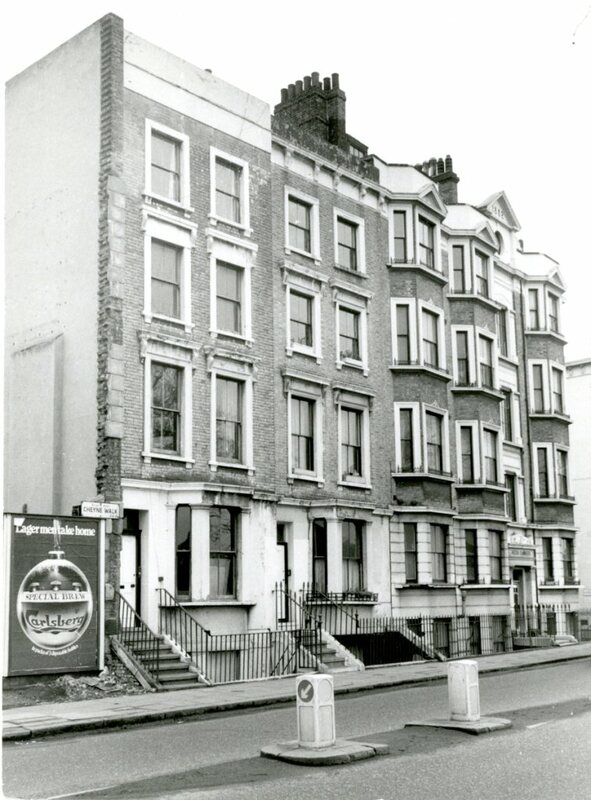 Apollo Place (partly visible on the right in the picture below) was once the home of Simon Le Bon of Duran Duran. On more than one occasion when I was at Chelsea Library teenage girls would ask to consult the electoral register to locate him. 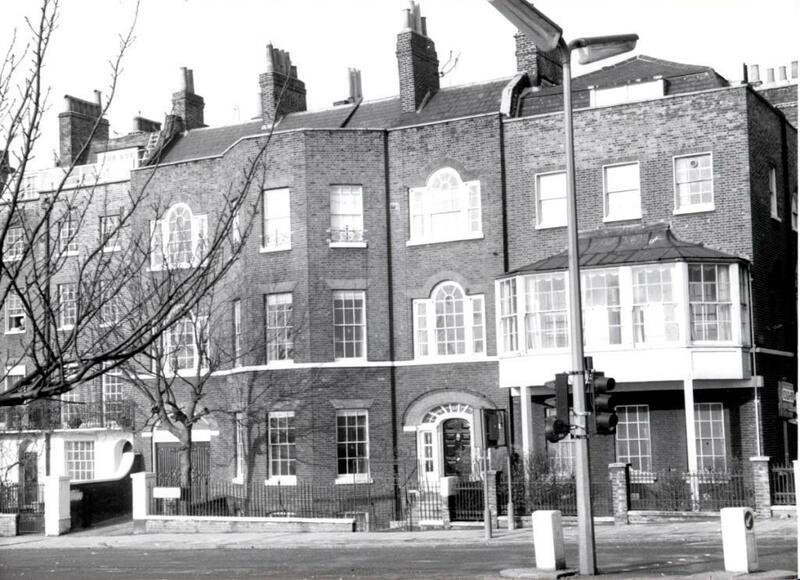 (When I worked at Brompton Library I would see groups of teenage girls gathered outside the home of another Duran Duran member in Gilston Road, off Fulham Road). Next to it was another more long lasting pub, the King’s Arms. An apocryphal story is told about a local celebrity buying one of these two pubs and closing it down because of the noise. I won’t name the person concerned because I don’t know if this is in any way true. 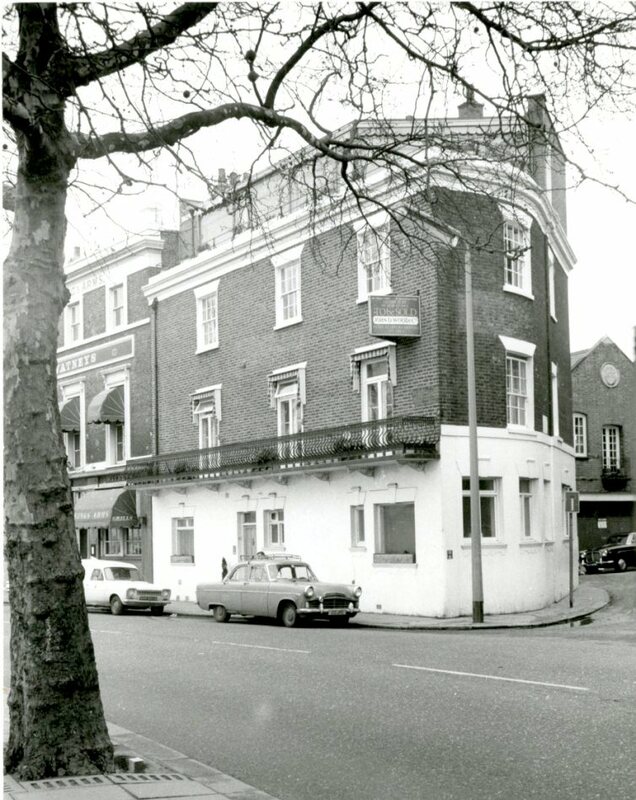 Many pubs in Chelsea have closed since 1971 for a variety of reasons. A picture from the late 1940s I think. Now go back to the first picture in the blog to see the taller buildings next to these as we move west. Those still survive but the ones in the final two pictures have gone. This is the corner of Luna Street (have a look at Luna Street another others here). You can see the street name, just about, and the word “shed” referring of course to one end of the Chelsea Football ground, and the group of fans associated with it. 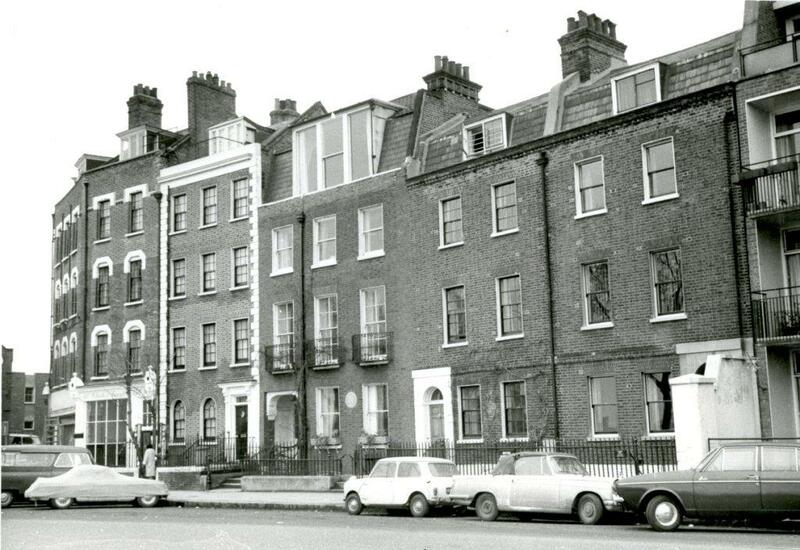 The final picture shows what remained of the terrace around number 132 as Cheyne Walk becomes Ashburnham Road. Marked by an advertisement for Carlsberg Special Brew. Close to this point is the end of Lots Road which we’ve looked at before. I’ve touched on the houseboats in another post but we may come there again in the future. This was a light post in terms of text and commentary but I know many of you will enjoy the pictures and don’t need much comment from me. I welcome any comments, corrections or reminiscences from readers. I’m a little late posting this week because of some last minute fact checking and link creating. 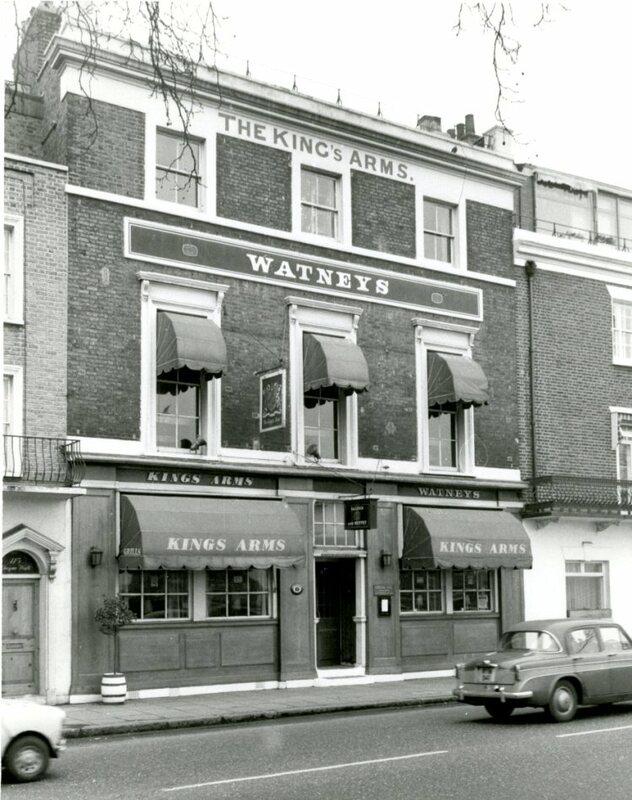 I’m off now to see if I can find a 19th century photograph of the King’s Arms which I have in my mind but I don’t think I’ve ever scanned it. This entry was posted on Thursday, March 23rd, 2017 at 10:37 am	and tagged with Cheyne Walk, James Hedderly, John Rogers and posted in 20th Century, Chelsea. You can follow any responses to this entry through the RSS 2.0 feed. Welcome back to Chelsea Dave! So much to say about these fascinating photos. Thanks for posting them. 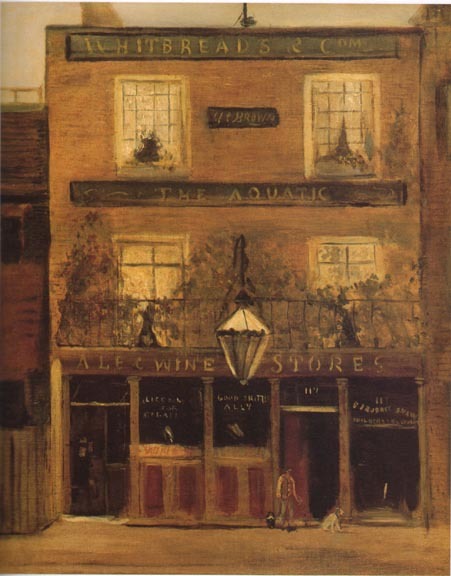 Aware of this Maitland painted The Three Public-Houses, Morning Sun Light in about 1889, in which he cunningly conceals numbers 115 and 116 with a sapling, giving the impression that the three establishments were really all next to each other. Talking of Turner’s, I came across this clip from the Antiques Roadshow a few months ago in which another painting of the house, in some ways similar to the one by Shepherd you linked to is being discussed. Here’s a good scan of it. I’m pleased to see McInness can spell slightly better than Shepherd. “Turner’s” house was also the home of the war widow Evelyn Beatrice Fleming née Evelyn Beatrice Saint Croix Rose, mother of James Bond creator Ian Fleming, for most of the inter-war years. Ian himself is on the electoral roll there from 1931 to 1936. 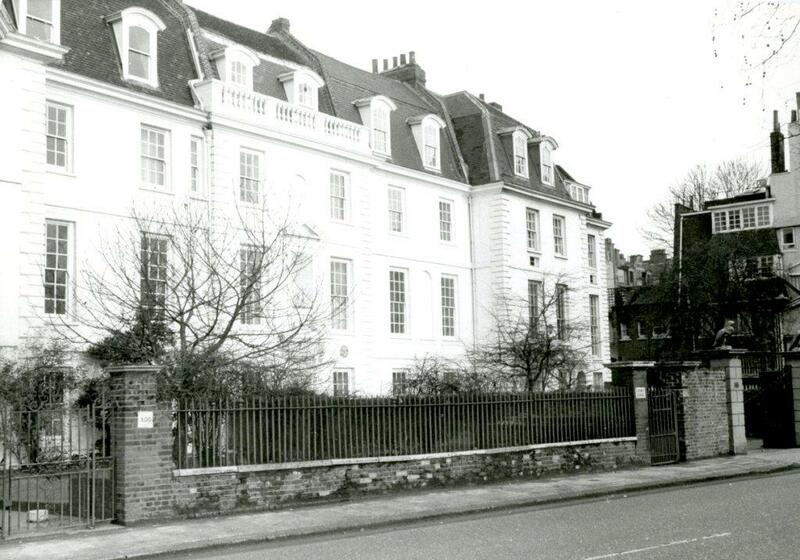 Interestingly, another Fleming, Alexander of penicillin fame, lived 300 metres or so downstream just off Cheyne Walk in Danvers Street, though the two Fleming families were not in any way related. 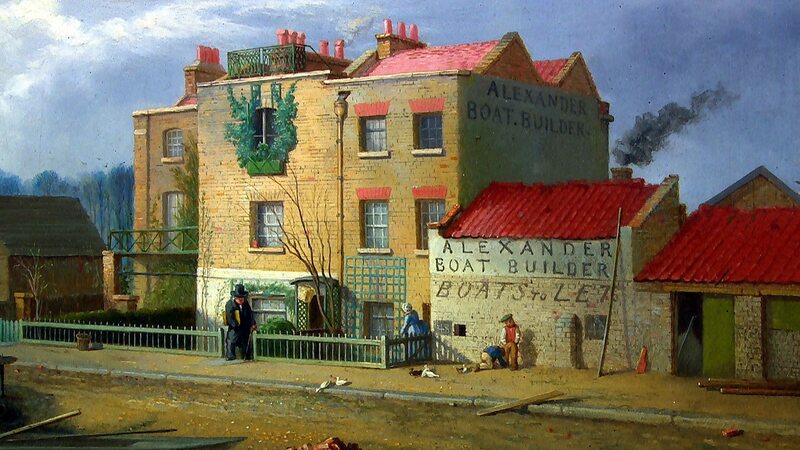 You might also be interested in this discussion I took part in on the Art Detective site all about the location of another Maitalnd, which, it turns out, was the Junction of Cheyne Walk with the now-no-more Luna Street. I just have a small correction to make. 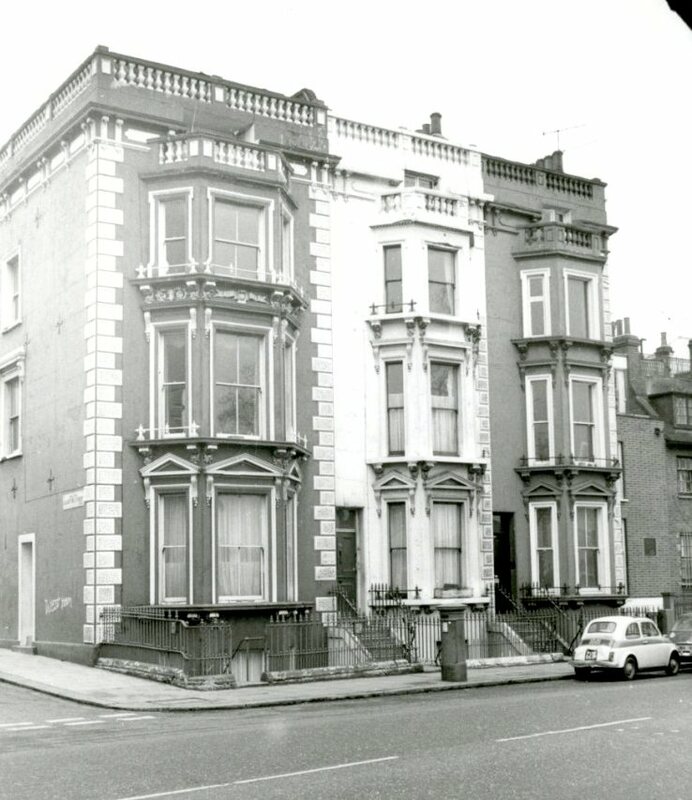 In picture 8 you say that Belle Vue House is on the right, but in fact it’s Belle Vue Lodge that’s on the right, on the corner of Beaufort Street. Belle View House is centre-left. Thanks – I found your comment in the spam list but have restored it to its proper place. Thanks for all these extra details and corrections. We’ve got a picture featuring the Aquatic somewhere here but I wasn’t able to find it in time for the blog. 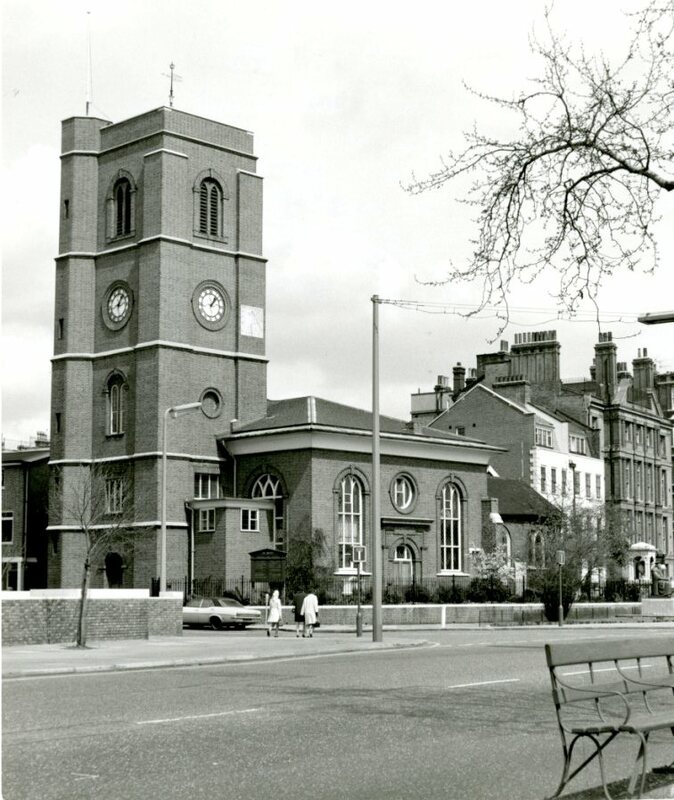 Played in short trousers on all the many local bomb sites including Chelsea Old Church. At a later date played bar billiards in the Kings Arms. 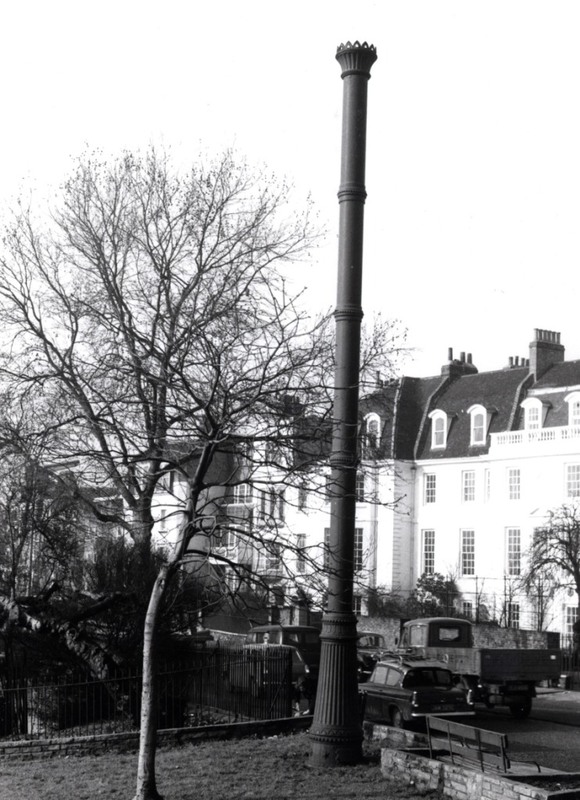 Is that perhaps a stench pipe opposite Belle Vue House?Just behind there was stunted mulberry tree of great age that was said to have been in St. Thomas More’s garden. Great shame that Crosby Hall is lost to us Christopher Moran who was barred from trading at Lloyds of London during the scandals had it surrounded with ugly railings and hoarding for many, many years.